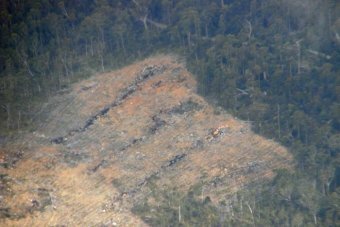 The Tasmanian Government is confident a decision to scrap a plan to ban broad-scale land clearing will not breach its commitment to retain 95 per cent of the native forests that existed in 1996. New rules that were expected to come into effect next month would have prevented farmers from clearing more than 20 hectares over five years. But Resources Minister Paul Harriss has announced the limit will remain at 40 hectares a year while a review of the permanent native forest estate policy is undertaken. "Business as usual will be available from the first of January 2015 to the first of January 2016," he said. Mr Harriss said only 720 hectares were cleared last financial year. "That 95 per cent of the native forest estate which existed in 1996 still has about 6,000 hectares in the bank," he said. Vica Bayley of the Wilderness Society has warned broad-scale land clearing puts threatened species such as the orange-bellied swift parrot at risk. "In some regions of Tasmania there's absolutely nothing left in the bank," he said. Tasmanian Farmers and Graziers Association's Jan Davis said the move will allow them to expand crops to capitalise on the benefits of new irrigation schemes. "If it frees up some land for us it's an important part of the overall picture," she said. Farmers are also calling for compensation for decreases to land value due to caps on clearing. The policy review will form part of the $500,000 review of the Regional Forests Agreement.